You may receive updates from #WeStillHere, the sponsor of this petition. 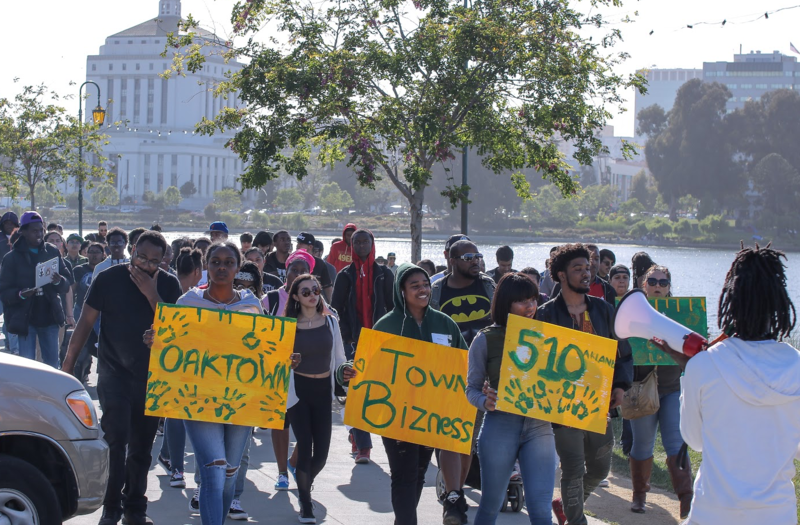 SIGN THE #WeStillHere_Oakland PLATFORM TO SUPPORT THE MOVEMENT AGAINST GENTRIFICATION & DISPLACEMENT IN OAKLAND AND TO BE INFORMED OF FUTURE OPPORTUNITIES TO GET INVOLVED. Quality working class, low-income, and no-income housing & shelter for all. The use of public land and public resources to improve the quality of life for Oaklanders being displaced with community decision making. Quality, equitably resourced, public schools that are relevant to students of color which include things such as programs that advance Black and Brown students in math and sciences and restorative justice and peer counseling programs as support and intervention for students. An end to the criminalization & mass incarceration of communities of color & the right to have fun without being criminalized. An investment in community-based alternatives to policing and incarceration that create real community safety. Quality, permanent jobs & economic opportunity for Oakland locals. BACKGROUND: Oakland, California is our hometown. It is a city with an extraordinary past, a legacy of radical activism, and a rich, diverse culture all its own. It's the land of the Ohlone people, the birthplace of the Black Panther Party for Self Defense, the city where Bruce Lee once lived and where Cesar Chavez first started organizing. It was Tupac’s spiritual home and the home of Soulbeat, Festival at the Lake, the East Bay Dragons, Everett and Jones, Flints, Ricky Henderson, Marshawn Lynch, Gary Payton, Dru Down, Too $hort, and 3XKraxy. Oakland is a community where Black, White, Asian and Pacific Islander, Native American, and LatinX people have lived together for generations. Over the past several years Oakland has experienced a wave of gentrification and displacement characterized by a rapidly rising cost of living and skyrocketing housing prices. Many Oakland locals have been pushed out of the area, creating a huge demographic shift - namely a drastic decrease in the number of Black people living in Oakland, a city that was known historically as a center for Black culture and community. Already we have seen the African American population in Oakland decline from 48% in 1980 to 28% by 2010. For those of us who were born and raised here, this wave has had devastating and heartbreaking consequences. We have watched as our friends and family members moved away. We have seen some of our neighborhoods become unrecognizable. We have witnessed a rise in homelessness, the likes of which we have never seen. And we have seen a rise in the criminalization of Black and Brown people, increasingly made to feel unwelcome in the city in which they grew up. A movement to reclaim public space is a good start but we also need to make political and economic changes - changes to how we build the economy and changes in the laws, policies, and practices that govern our community to realize our vision for an inclusive and equitable Oakland. We must fight for the real changes that are going to make it possible for Black people and other people of color to remain in Oakland. The identity and heart and soul of our city are on the line. Gentrification threatens to erase the history, culture, and identity of Oakland in just a matter of years. Oakland is far too special of a place for this to happen. We want an inclusive and equitable Oakland, one which embraces the future and stays true to our past. We envision an Oakland that continues to be racially diverse, family friendly, and rich with the culture and tradition of activism. By signing the petition, you are supporting the rights of Oakland residents to show the City and elected officials that #WeStillHere. This platform was co-authored by the 510 Day Organizing Committee and youth leaders from Urban Peace Movement and AYPAL: Building API Community Power. I agree to the following platform, and want the City, the County, and Officials to take action to protect Oakland residents from gentrification and displacement. The use of public land and public resources to improve the quality of life and housing for Oaklanders being displaced with community decision making. Quality and equitably resourced public schools that are relevant to students of color which include things such as programs that advance Black and Brown students in math and sciences and restorative justice and peer counseling programs as support and intervention for students.